Thinking about our brothers and sisters in Puerto Rico and the U.S. Virgin Islands, we are requesting donations of various personal items. Please click here for a list. Pocket-size pkgs of tissues and lotion. Please share this with friends, family and coworkers. Together we CAN help! Jesus said, As you did to the least of these, you did unto me. We continue to support our elementary schools with books, shoes, and school supplies for those students in need. IHN is dedicated to providing shelter, direct services and housing assistance to homeless families. Begun in 1988 as a response to the growing crisis of homelessness of women and children, volunteers from a network of more than 60 congregations in Essex County provide shelter, food and support. The West Orange Presbyterian Center is now a hosting site for IHN. UPCWO and Elmwood West work together to provide shelter, in the manse on the property, for a week at a time to 3 or 4 families from IHN. Other congregations and volunteers are welcome to serve with us. For more than 50 years, Presbyterians have joined with Christians throughout the nation in supporting One Great Hour of Sharing, responding to Christ's love for all people by joyfully sharing that love with people in need. During the season of Lent, both children and adults at the United Church focus on contributions to OGHS, which go to the Presbyterian Church (U.S.A.) to support Presbyterian Disaster Assistance, the Presbyterian Hunger Program and Self-Development of People. BLANKET MONTH YIELDS ENOUGH FOR 164 BLANKETS! 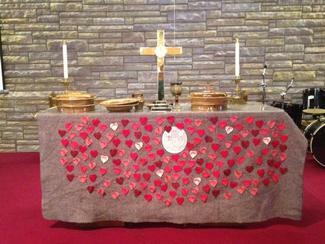 Every heart on the blanket represents a donation of $5 for a blanket donated to Church World Service. CWS works in partnership with communities to identify their needs and access the resources they need to rebuild their future, including blankets, tents, food and other emergency supplies in the wake of a disaster; tools and seeds for refugees returning home to plant their fields; wells for families living in drought prone areas, and literacy training and microcredit for women struggling to realize their potential. UPCWO holds a Blanket Drive every February.